“The Children of Craig-y-nos” story– of sick children locked up in a remote haunted castle for years- has touched people around the world. I am almost ashamed to tell you that I first heard of Craig-y-nos through a book I happened to buy last weekend entitled "Ghosts of the World". I bought it on a lark, as I had been sick and unable to participate in our usual "Haunted House" outings we take during the Halloween season. Anyway, I happened upon a story about Adelina Patti and her castle. 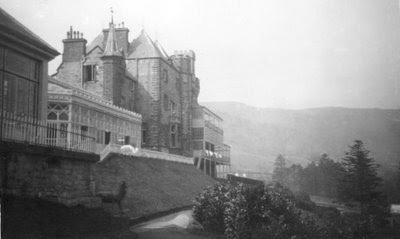 Although it was very brief and vague, it mentioned the ghostly sounds of children giggling and playing in various parts of the castles...remnants of an era when the castle was a hospital for TB patients. Captivated by such an intriguing collection of stories for one castle, I decided to research the castle online. What I found was so much more than I would have ever expected! All the stories and photos of the people, mostly the children, who were treated in this “hospital”, captivated my heart. More than anything else, I wanted you to know that your story has touched me so that I plan to share this with my friends. It is not a whimsical look at "sick kids in a castle" or even for the rush of telling ghost stories. My parents gave me the special ability to give appreciation to human life and the stories we can gain so much from. I am so glad I found this story. Thank you for all your hard work to share this almost lost moment in time...and THANK YOU for sharing it in a way that it even reached someone like me...all the way in Houston, Texas, USA.